What would you say if the Carnivore Club asked if they could send you one of their monthly boxes to sample and write about? Yes, of course (as the Accidental Locavore is not a vegetarian)! The Carnivore Club is pretty secretive about what’s in the boxes. If you look at their past boxes, there’s a lot of wonderful charcuterie from some impressive places. That’s what I was expecting. That’s not what I got. A very handsome box arrived in the mail the other day. Nothing perishable might have been my first hint. Maybe it’s a guy thing, or maybe my last (only) batch of homemade jerky wasn’t thrilling. It’s a perfect golf snack. Protein, lightweight, no need for refrigeration—I tossed a random bag in and went off to play a round. Bacon jerky, who knew? With maple and buffalo flavor. Yum! The only reason it wasn’t totally consumed between holes 15-17 was the result of enormous willpower (and the possible need to take photos). 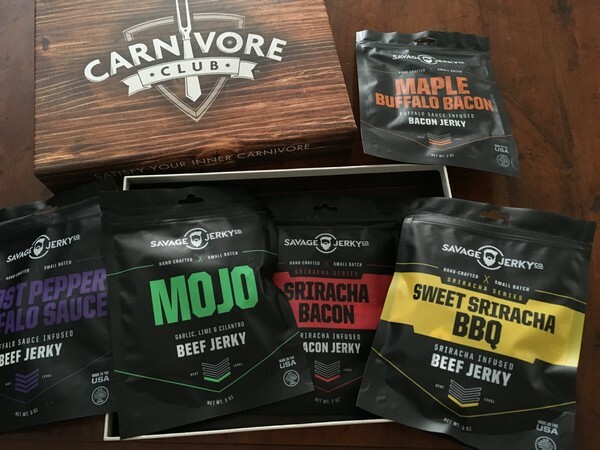 The Carnivore Club is a pretty smart subscription service. You sign up for three months (minimum) and then you can customize whether you want the boxes monthly, every two or three months and the delivery date. It’s $50 a month, shipping included. Everything (not just my jerky) is vacuum sealed and has a shelf life of 1-3 months. 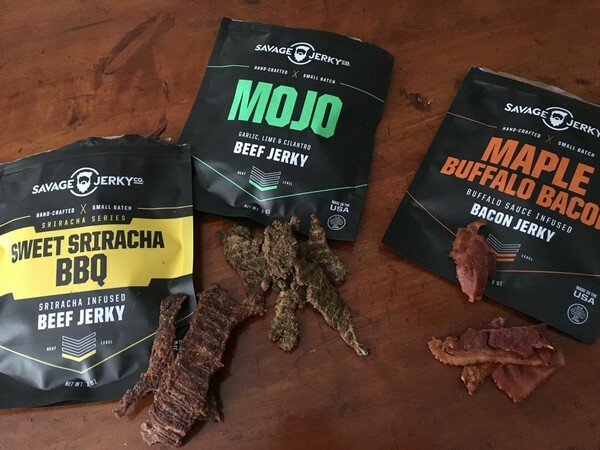 Maple Buffalo Bacon: I’d never heard of bacon jerky, but will probably make up for it in short order! Tender, a little sweet with a hint of spice, and easily finished in a matter of minutes. As their flyer says, ”Good luck not getting completely addicted.” Too late. Sriracha Bacon: A close runner-up. Guess I just like bacon jerky. Traditional Mojo Beef Jerky: My favorite of the beef jerky. Lime, cilantro, garlic and cumin are always a good combo. A little chewy but maybe it’s like apples, you burn off more calories chewing than you’re consuming (wishful thinking, right?). Sweet Sriracha BBQ Beef Jerky: A close runner-up to the mojo. This has a little more spice, tempered by molasses and brown sugar. Ghost Pepper Beef Jerky: If you’ve seen more than one episode of Man vs. Food on the Travel Channel, you’ve seen a restaurant where the challenge is to eat something loaded with ghost peppers. It’s very much a macho challenge. So I rose to it. It’s edible in small pieces, but I think this bag will last a long time. One of my house guests (always subject to random food tastings) suggested crumbling it into chili and I might also toss some into fried rice. Sadly, I didn’t get my box until after Father’s Day and my brother’s birthday—it’s a perfect gift. Keep Carnivore Club in mind if you need a treat (always), something to send to someone at college (they’ll make friends fast) and the holidays (coming up faster than you think).